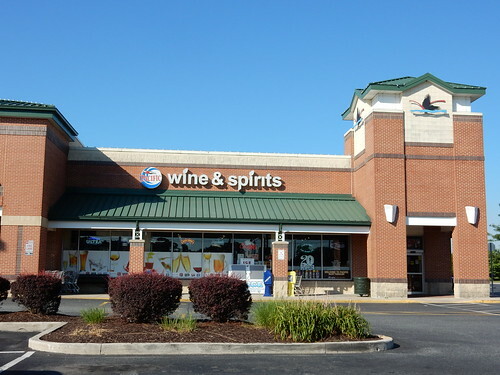 This former Superfresh Wine & Spirits store is one of a kind! Sitting next to the Superfresh, now Acme, in Rehoboth is truly one of the most interesting things you will ever see related to A&P. The Superfresh has since been remodeled to Acme's standard Quality Built decor, but this part still retains Superfresh's old decor, carts, and signage! Just look at the leaves above the "I" in Wine and Spirits. Starting off strong with... eh, standard black cases. These were a standard issue for all Superfresh coolers during the Fresh era. Now here's where it gets interesting! Not only Fresh 2.0, but even down to the checkout lanes! It's a Mini-Fresh! Another blurry shot thanks to viewers on Google Maps. Views are limited for this store, mainly due to the fact it's a liquor store, not a supermarket. Many owners of liquor stores are more vigilant about others taking photos within their stores, mainly due to the high cost of merchandise, and the fact it looks like you're planning a robbery sometimes. A larger view of the overall decor and flooring. This store is practically identical to the produce department that resides less than a hundred feet away.